Flowers: Family of Five. : Gooooaaaaallll! We decided earlier this year to have Patrick try out a sport. At only three years old, you would think the options would be limited but you'd be very wrong. 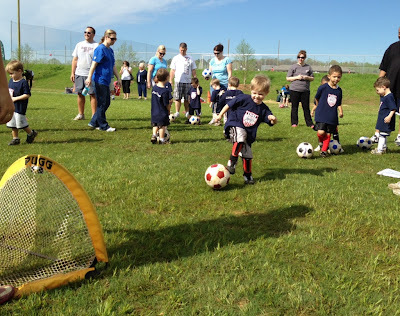 It seems like every sport you could play has a league that starts around age three and people get pretty serious about it. We knew we didn't want this to be a serious thing at all. It was more an opportunity for him to have an activity of his own and see if he even liked this sort of thing. 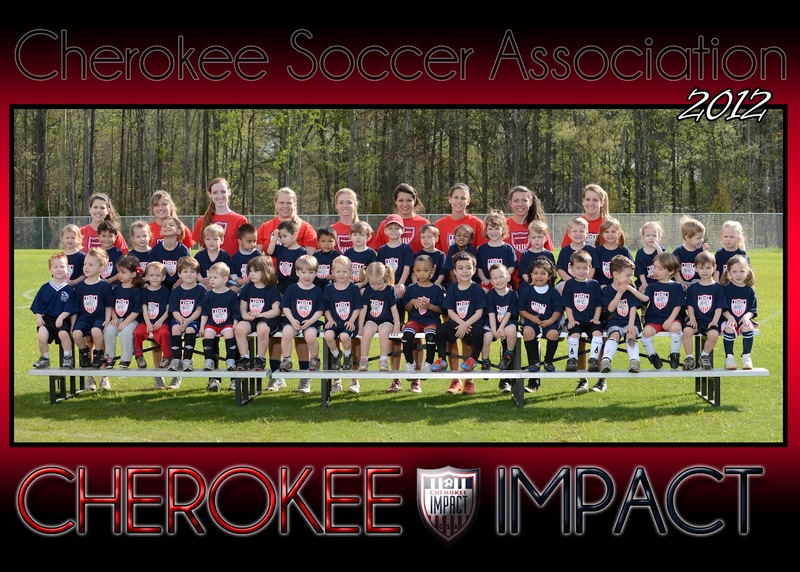 Angie did some looking around and found the Cherokee Impact soccer league nearby and by their description of "if you're the kind of crazy parent that's going to beat up another parent when your kid loses a game, go somewhere else" (I'm paraphrasing) we deemed them a good match for our mindset and signed Patrick up. He was very excited to get his own cleats, soccer ball and, most of all, shin guards. When we would play soccer in the back yard he kept yelling, "Dad! Kick the ball at my shins!" so he could test his new gear. The season was six Saturdays long and lasted an hour each time. They basically did various soccer activities for the whole time then, in the last three weeks, had scrimmages for the second half where the kids were on teams against each other. So, did he like it? Patrick has always been a kid that takes time to warm up to new things. 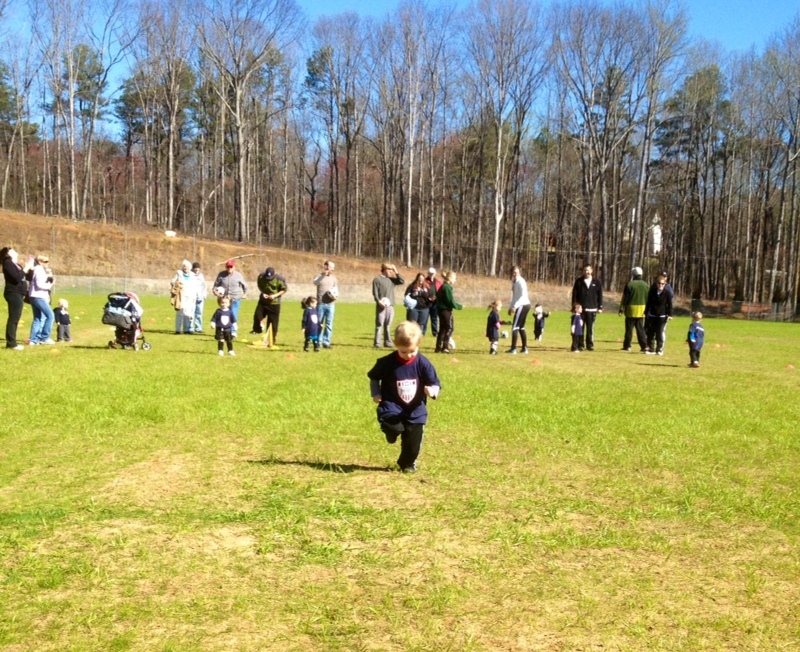 Luckily, all the kids' parents were out on the field with them since everyone was so young. It helped that Angie and I were able to be on the field with him at first. Each activity only lasted about 5-7 minutes before they moved onto the next one. For Patrick, that meant he spent the first few minutes just trying to understand what the activity was and making sure he knew all the rules. By the time he felt like he knew the rules enough to actually start participating in the activity it was almost time to move onto the next one. I felt bad for him each time he would start to really get into it then we'd have to change right away to something new. After a few activities though Patrick really had fun. Once he felt like he knew what the rules were and what to expect from the games, he jumped right in. A couple of his favorites were Tunnel Soccer (where I would run then stop and he'd have to kick the ball through my legs) Belly Button Tag (I would dribble the soccer ball and he would come tag my belly button/punch me in the stomach then he'd dribble the ball and I'd tag him), red light/green light and kicking practice goals. Then came the scrimmages. These did not go as well. Patrick isn't a huge fan of confrontation so having a group of kids specifically "against him" was not his favorite thing. Add that feeling to his general discomfort with high pressure situations and the games were kind of his worst nightmare. He would sit on the sideline of the game with me and watch, then every once in a while run out to the field and maybe even kick the ball then would run back to me and say he didn't want to play. I'll admit it was a little frustrating at times. Mostly because I couldn't figure out how to tell him that none of this really matters. One day when I asked him at home why he didn't like the game he very plainly worried "I'm afraid I might kick the ball and it won't go in the goal." That was his whole hangup. He had the expectation of himself that if he was going to play soccer then there should be a goal every time he touched the ball. I tried explaining to our little perfectionist that he doesn't have to score any goals and that real soccer teams have people who never actually kick the ball in the goal at all but instead just kick the ball to their team mates. He didn't really buy it though. He knows when we're trying to make him feel better and whether we're right or not, it bothers him. All in all, I think it was a good experience for him. I think it's important that his comfort level gets challenged and that there's some friendly competition for him to have to deal with. If we could have changed something about it, we would have liked the league to be slightly more organized. We picked this one specifically because it wasn't hyper organized but it definitely felt like a kind of free-for-all at times which I don't think helped Patrick much. But he really did have a great time other than the scrimmages. We still play some of the soccer games they taught him at home and he still talks about the fun things he remembers about it. As a bonus, no parents got in any fights all season and I never once had to punch another dad. Which is great because I'm probably not very good at it. At the last session, each player got a medal. It didn't matter that every kid got one, they each felt very special and were glowing as they walked away from their coaches. 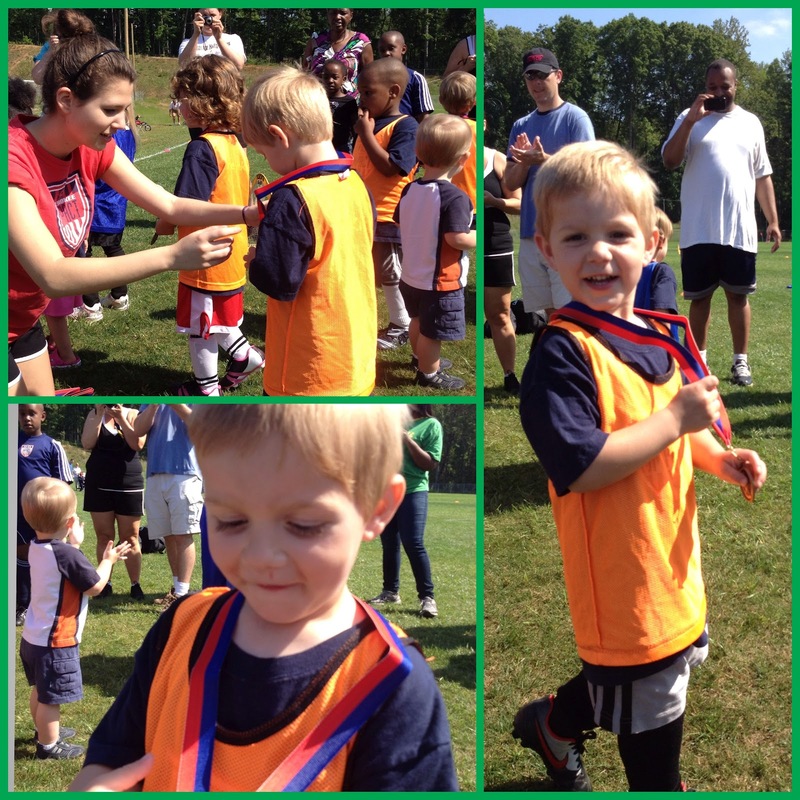 Here's our little soccer player, very proud of his new neckwear followed by some more pictures from the season. One thing Patrick's got going for him is the race cars in his bones. This picture is from a game of red light/green light where the coach had just said green light. All the rest of the kids are trying to figure out what exactly they're supposed to be doing and all the adults are trying to explain it to them. Meanwhile, Patrick is half way across the field. The kid is fast. Here's Patrick's professional shot. They took a really great one of him smiling but for some reason chose to send us this one. Also, we got him a haircut after this game. Probably should have done it before. But if this kid can kick like he can grow hair, he's got a big future in soccer ahead of him. 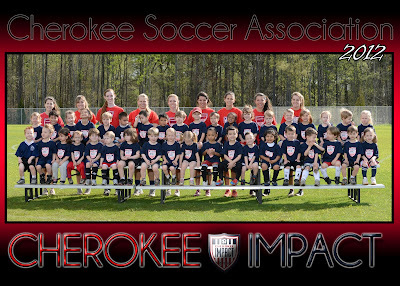 Here's the team shot. Patrick is back row, second in on the right sitting next to his friend from school, Avery. Lastly, a big thanks to all the family members that came and watched Patrick play. I know it meant a lot to him and he loved having you there!